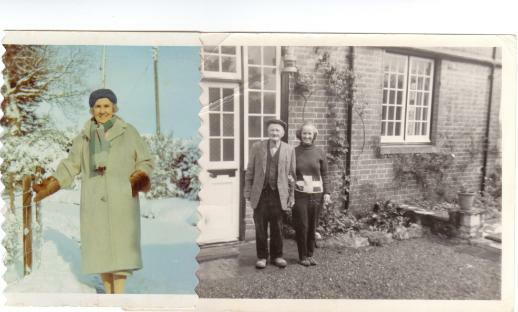 I recall being awestruck with our neighbours Captain and Mrs Stidston,* who lived at Ashe. Not only did they cut the crusts off sandwiches, but they had a live-in maid called Kath: she had been there for years. It would have been Kath who cut the crusts off, for sure. Our house was extremely cold in winter - you had to be highly motivated to move from in front of the fire (sometimes a coal fire, sometimes two bars of an electric fire). I was known to wear my dressing gown in bed. The Big Freeze of 1962/63 occurred soon after we moved to Ashburton - I went to school in Newton Abbot at the time (or rather I didn't).It must have been extremely hard for my Dad, 'H' Lowell, because as the newsgent he had to walk about a mile down to the shop very early in the mornings (5.30? 6am?) for the arrival of the daily papers. I often went down to the shop (The Paper Shop at 6 North Street) on Saturday mornings, and then sometimes we bought fish and chips for lunch from Mrs Hambly - her shop was at 26 North Street. She was friendly, but always looked hot and bothered: her grey hair was only just held back in a bun because a lot of it escaped. The fish and chips were of course in grease proof paper, then wrapped in old newspapers. I am told by Wendy Major, and I confess I do not personally remember this, that there was always a cat on the window cill - right next to the fish. The formidable Miss Black presided over the library, which I think was in St Lawrence Chapel. She was so scary that in later years, as a young married woman, I remember ironing a library book dust jacket to flatten out the tooth marks of an exuberant puppy. 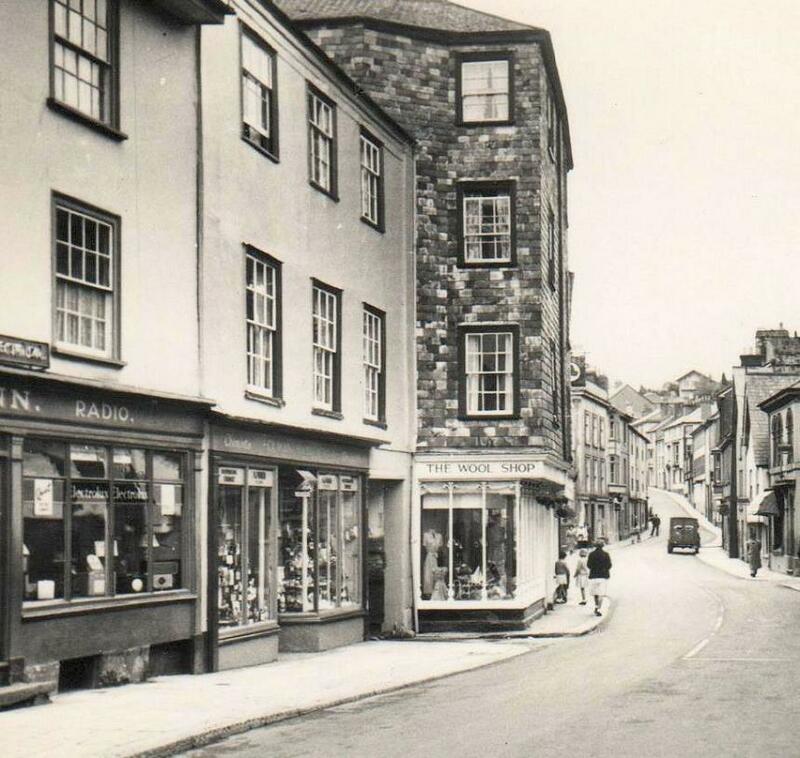 Frisby's shoe shop was at 8 East St., on the corner with St Lawrence Lane - Mrs MacDonald worked there. Other shops were: Mrs Underhill's at 2 Noth St., which sold tobacco and Sunday newspapers, and the Sun Stores at 3 North St., which was a general provisions and grocery store. Jim and Ruby Churchward were teh owners - Ruby Churchward was always cleaning: evenings, Sundays, any time it was shut. If she wasn't serving in the shop she was cleaning it. Parsons and Co was another grocders at 17 West Street (to the left of the arch). There was also Osborn's at 16 North Street - again in later years when newly married I remember buying loose broken biscuits there. The Kerslakes had a chemists at 44 East Street – they were always angry with each other. The other chemist in the town was Holman, Ham and Co in West Street. When I was 11 years old I attended Totnes High School - earlier generations who went there (or to the boys' school, King Edward the Sixth School) went on the train, Bulliver, but passenger services to Ashburton had ceased in 1958 (see http://www.southdevonrailway.co.uk/history for a history of the line). So we went on the bus - contemporaries or near contemporaries whom I remember are: Colleen Brixey, Shelagh Dent, Linda Paul, Alistair Macdonald, Brian Wright, Robert and Christopher Bray, John Furneaux, Peter and Susan Wakeham, Cynthia Fox and I believe Pauline Ash. The dual carriageway was not built until the 1970s – in the 60s the A38 was a single carriageway road that bypassed Ashburton. When prisoners escaped from Dartmoor, the police would erect roadblocks and stop traffic to search for the escapee. They would open car boots, or walk along the bus aisles looking for someone crouching behind the seats – it was very exciting. *** In The Collected Letters of Thomas Hardy, 1926-27, vol 7, p67 it is said that Ashburton Police, at the instigation of James Mortimer, made 'inquiries' into Alfred John Hardy's claims. The inquiries do not seem to have deterred him. For more on Chippy, see Crime and Punishment, under Ashburton in Peril.